Inspired by the Rococo menswear dated back in the 18th century, where military epaulettes becomes the main detail, golden/silver lining, detailed button, frills and frocks on blouse, and such. Blended with our signature style, preferably monochromatic (as always), probably by seeing these photo series, it will remind you of King Louis XVI before the 1789 revolution, or maybe you're curious of what marquis de La Fayatte's habit on a fine sunday afternoon? F21 pants. unbranded ruffle blouse. Robot Ninjas military jacket. Charles&Keith shoes. F21&Madame Butterfly bracelet. Sharing you my October playlist. Girllll, you look FIERCE!!!!!! Wow. This is a great photoshoot! im fricken inlove with your outfit i cant even tell you. Oh my, love this outfit! The shots are great too, look like magazine editorials. Love your style! Thanks for following my blog :o) I'm following yours for a while cause it's amazing! you're like something out of a movie! oh my, you're fierce and adorable at the same time. love. it. Yes a walk-in closet is a BIG BIG BIG wish of mine too..
such amazing, strong photos, love it!! I love this Rococo inspired outfits:) Beautiful shots, too! Your pictures are truly stunning, I LOVE them all!!! these are so great - i love the inspiration and the outfits! (that's my favorite era) :) and thanks for your comment! i have the same shirt with urs..and i love to wear it..
aww lovely blazer and top! chic! 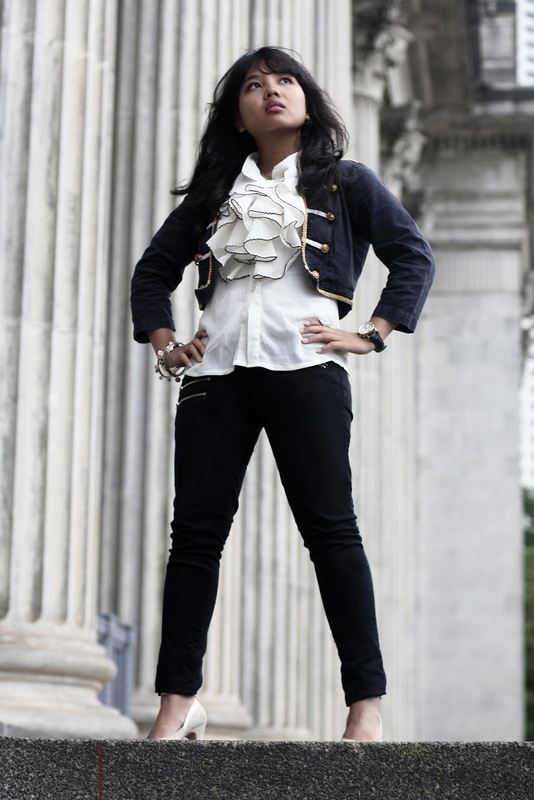 oh my god, absolutely loveee this french revolution inspired outfit! awesome photo shoot :) will definitely be back for more! 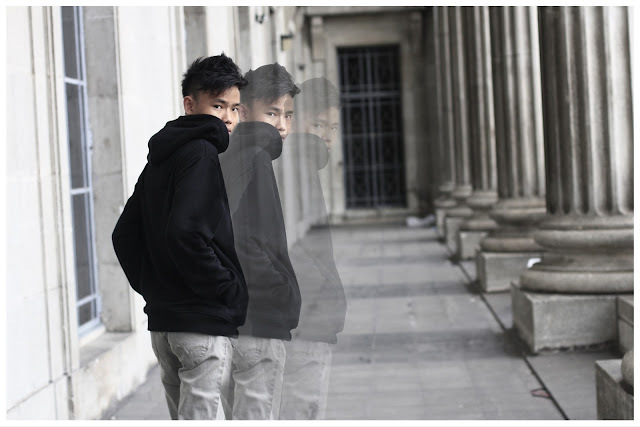 did your boy take these pictures ? awsome photos! im in love with your gorgeous outfit :) i have followed you, hope you follow mine too :) wanna exchange link? your jacket is fab!!! loving the inspiration and the photos!!! definitely a popular inspiration! looks so cute on you! thanks for the sweet comment you left me. you have a lovely blog. Love the outfit! That military jacket is gorgeous! I love the editorial that picture is from! Annie Leibovitz is such an amazing photographer! so amazing. i adore the details of your jacket and the top too. LIKE! love your outfit from head to toe! esp your jacket and ruffled blouse...and oh yea pumps too. so basically head to toe yea! Love that bib top of yours! Gorgeous. Hi Fhen! Girl you look SMOKING HOT! I love your outfit from head to toe! and yes, I'm in Singapore too! want to meet up? like a fashion meet up session? lol! I'm in RP. u? i adore your military jacket ci! love your top... and definitely you look fantastic in it! Love your outfit - especially the heels & ruffles! Wow, wow, wow amazing outfit and cool special effects there!! omg c fhen! the one your hands on your hips are totally fierce and you act like a queen ya know! yeah I went to iwannagohome and the Christmas decoration and some florist even start selling the green rain-deers and it was like eh so fast duh and some even start putting X'mas song! miserable at best was at the top of my playlist too a couple months ago until it wasn't anymore. but it was absolutely a great heartfelt song. Following you to keep track of fashion history lesson. LOVE everything about this outfit, hun! Military themed jacket + ruffles are so perfect together!! oh wowww I love this entire outfit! The ruffles and the details on the blazer! this is hot! Wow this is such a great take on the inspiration! And the 'in motion' picture is too cool. Must learn how to do that! Your channeling the French court wonderfully, Fhen! Oh wow I love ALL these photos! Absolutely adore that military inspired jacket, it's perfect! what else would i say other than FIERCE! Love how you got a bit of a history lesson there! I love the whole Victorian way of dressing. So proper! Great jacket and heels btw. the ruffle blouse is gorgeous! great outfit! I love that you included the top picture for a bit of referencing. Sometimes, people don't seem to know where a fashion idea came from. YOu look awesome by the way. As someone else said, fierce. wooww!!! your outfits are greaaat..
Nice and amazing post. I like it. Keep it up. Great look. The first pictures is just amazing. Keep it up and thanks for sharing! Fab look! 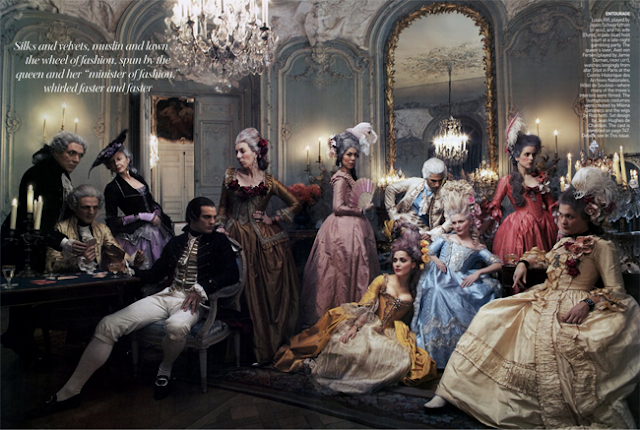 I love the French Royalty reference - makes me want to watch Marie Antoinette again! what amazing photos! 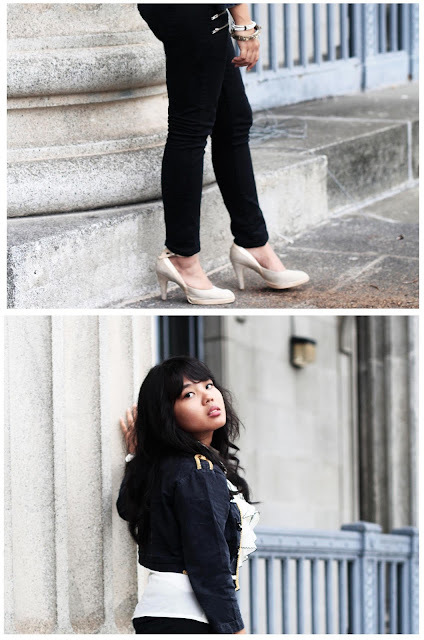 im loving your fashion in this post, your heels are to die for ! Love love your blouse!!! Your pictures are amazing :D Good job Fhen! great photoshoot!love your ruffle top. and the military jacket is soo cool! love it! Hey girl thank you so much! I am loving this outfit! Esp the blouse and those heels! I definitely love this style and how you interpreted it. its so easy to let this trend look costume-y but instead you look completely chic! WOW. Look at these photos! Definitely one of my favourites of yours - YOU LOOK SO FIERCE. love ur blouse, and great photoshoot! Awesome outfit and photos! People have already said this a bunch in your comments, but definitely super fierce. :] So dramatic! Love those military styles on you guys (and that photo effect). You guys look great, esp. juxtaposed against the background. nice military jacket there! killer! i think the location and the clothes are great..
love your blouse and military jacket.. lovely! I am literally dying over your blouse. What a stunningly gorgeous look! I love your blog a lot, it's gorgeous and you write ever interesting things ! I love your sense of style so now I follow you via Bloglovin. both of you guys look really great! love this look! i love military style everything this season!